It's the cornerstone of Christmas baking. A fabulously festive union of traditional rich fruitcake and decadent decoration. Yep, it's time to dust off your largest mixing bowl and flex your triceps: Stir Up Sunday is just days away. Convention has it that your mincemeat, Christmas Pud and Cake are all due to be baked on Sunday and even if you only get round to one of the three this weekend, a more genial, satisfying introduction to the Christmas cooking there cannot possibly be. As always, buy the best you can afford. No decade-old, long-forgotten bag of Mixed Fruit lurking at the back of the cupboard. Try not to be tempted to use up that bottle of dodgy, unnamed liqueur you picked up in Duty Free on that disastrous School Exchange in the mid-nineties. And invest in a good quality, heavy duty cake tin- it'll become a family heirloom, I promise. Soaking the fruit will ensure plumped, juicy ingredients that will keep the cake moist and ensure longevity. But how long should we be soaking? An idle flick through my mountains of cookbooks shows Mary Berry soaks her fruit for a mammoth three days, Delia Smith overnight and Nigel Slater a paltry four hours. Both Nigella and Jamie boil their fruit in their chosen booze before soaking overnight. But what should the fruit be soaked in? A further idle flick through the cookbooks indicates that Mary plumps for sherry, Dan Lepard opts for stout for a more malty flavour, Nigella advocates rum. Just make sure you have a little left over- a "baker's bonus" if you like. Making a non-alcoholic cake? Omit the booze and use orange juice or cold tea. As if Stir Up Sunday doesn't contain enough tradition, don't forget the warm spices, which represent the gifts brought to Baby Jesus by the Three Wise Men. If gold, frankincense and myrrh are out of stock at Waitrose, All Spice, Nutmeg and Cinnamon make the ideal store cupboard stand-ins. 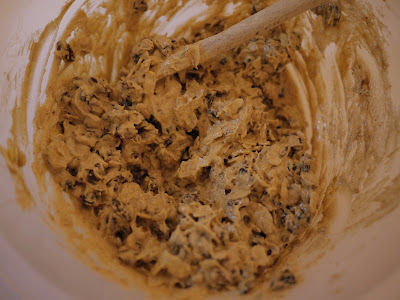 Christmas cakes are always baked at length at low temperature. Too high an oven temperature and the fruit will burn. It's also vital to line both the inside and outside of the tin with paper: a double thickness of parchment paper on the inside, and a few layers secured with string on the outside. If you've run out of parchment paper/used it all on wrapping presents, newspaper on the outside will do the trick. Every week until the week before Christmas 'feed' the cake. A few teaspoons of booze for the cake, a tumbler for the baker. 'Tis the season of goodwill and all. Now this is the fun bit. Let your creativity loose! Let out the artist in you! Perhaps, like me, you liberally cover your cake in a doorstop of marzipan and a foot of icing before haphazardly placing kitsch fondant decorations on top. Maybe you bring out your family childhood Christmas cake decorations, a balding reindeer or jolly Santa, a lump or two of last year's icing still stubbornly stuck to the bottom. Or perhaps your prefer a classic crunchy nut and dried fruit topping. 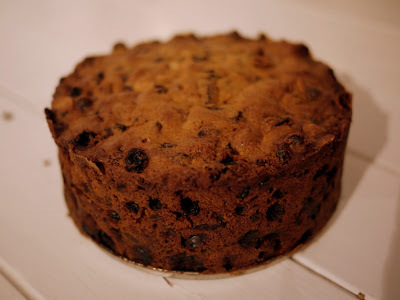 I've adapted this recipe from Delia- I usually make two or three small, six inch Christmas Cakes. These make great Christmas presents, presented in a lovely festive tin and tied with a bright ribbon. 2. Preheat the oven to Gas Mark 1/ . Prepare a six inch deep cake tin: grease and line both the inside and outside of the tin with paper: a double thickness of parchment paper on the inside, and a few layers secured with string on the outside. 3. Cream the butter and sugar together for several minutes until light and fluffy. Add the beaten eggs, a little at a time, beating thoroughly after each addition. Fold in the flour, salt and spices. Stir in the soaked fruit, almonds, treacle and zest. 4. Spoon the mixture into the prepared tin and level out evenly. Christmas pudding is making a comeback in the States and can be really delicious! I'm thinking of trying my hands at baking a couple this weason. A very handy guide, who hasn't been tempted to "use up" old ingredients in a Christmas cake! This Christmas Cake is looking yummy. It is simple and easy to make. All the ingredients are nice. I would like to make on this Christmas. Yes yes yes. Really must do this this year. Thanks for the reminder. I don't usually make a Christmas cake because none of my family like mincemeaty things but then I thought - hold on, I love Christmas cake so I made my first this year. Currently feeding it so we will see what it is like in a couple of weeks! Hope it looks as good as yours.